Paradise Residence Vol. 1 Review – AiPT! From the creator of Oh My Goddess! comes a new series called Paradise Residence. Now, I never really read the manga version of Oh My Goddess!, but I did enjoy the anime adaption and thus, I’m hoping for something as sweet as that was. Let’s see what we get. On a mountain in Japan resides Kikka Academy, an all-girl boarding school, including several dorms for the students to live in. In a particular one called Dorm 1, a quirky and silly girl by the name of Hatsune Takanashi lives. This is mostly her story… along with the other colorful characters living there, from a grade schooler house mother to a foreign exchange student that doesn’t grasp the concept of modesty all that well. Paradise Residence is a slice-of-life comedy. It’s just about the girls, with more on Hatsune and Dorm 1 and how they get through their school and private lives, along with all of the shenanigans that they get into. It’s a series that reminds me of Yotsuba and K-ON!. However, this series is much slower paced and lighter on the comedy than those and others like it. This ended up being both good and bad in the end. For those wanting something a bit more down-to-Earth in their slice-of-life series, but with a dash of wackiness, this series should fit the bill. There are certainly some unusual and goofy moments to it, especially whenever the lead character enters the picture (her ongoing battle with the dorm dog or her determination to track down the real Dorm Mother in some of the chapters jump to mind), but it’s a lot more laid back than something like K-ON! or Azumanga Daioh. The characters are more down to Earth and aren’t too zany or one dimensional, leading to a better atmosphere and humor that’s more subdued at times. The only exceptions to this are Hatsune, who is very energetic and goofy, and Stephanie, who is way too open about her body in public. Otherwise, it’s rather relaxing in its own way and good for those who want that. Kosuke Fujishima’s writing and the translation job are both decent for the most part. The pacing is slow, but not glacierial–so the story never feels tedious or dragged out at any point. The characterization is basic, like a lot of these types of series, but everyone has a distinct point or two to them that helps separate one other and adds to the humor. There are quite a few good jokes sprinkled throughout the book, at least enough to make you chuckle. My personal favorite line: “Even my beloved pudding is an agent of the British Empire.” The dialogue is fine, with some good lines like that and some warm bits throughout the manga. Nothing too bad here outside of some exceptions. The artwork looks rather nice as well, though with some hiccups I’ll get into later. Fujishima really nails drawing his characters and making them rather expressive. There’s such a great range of expression and emotion with these individuals as they talk and interact with everyone, especially with Hatsune and how emotional she can get at times. The layouts are easy to follow along with and the locations are detailed enough to make them feel lively and real. There’s also a nice sense of motion and movement in how some panels transition from one to another at times, like when Hatsune is trying to track down the Dorm Mother. It’s a nice looking book overall… most of the time at least. Despite the positives, I felt there were still some problems here. For one thing, the characters aren’t particularly memorable. Like stated before, they do have some character traits that separate them from one another, but they don’t have much beyond that and some of them are hard to distinguish. Quite frankly, maybe having of their character traits more exaggerated would have been more beneficial to these characters. Some of the humor is sometimes too subdued to be noticeable or is wrapped up in Japanese culture, so the jokes don’t translate all that well. There are moments where the translation nosedives when it comes to dialogue as well for some reason, making some moments really sound unnatural and awkward (the opening to Chapter 6 really stood out to me), while some of the transitions felt too abrupt. I disagree. Pizza is a treasure of humanity young lady!Lastly, there are some issues with the artwork, mostly involving the characters. A lot of the girls have similar looking faces and at times, similar hairstyles and color that make them hard to distinguish. For instance, I mixed up Komatsu and Suzuka at times due to their hair color and face. Also, there’s the little girl who helps clean things up around the dorm and Fujishima seemed to really struggle with depicting her at times. Sometimes she was too short, her head was too big, arms or legs were way too long, or her torso was tiny in comparison to her body. It felt like the creator was really having trouble with drawing a child in this book and it ended up being rather distracting at points. Kodansha also included an extra 100 pages of bonus content with Paradise Residence. As such, there is more here than just the main story. We have extra short chapters about the cast, “photos” of the characters, and a short prose story as well. While there isn’t much to say about the prose or “photos”, the short chapters were interesting. 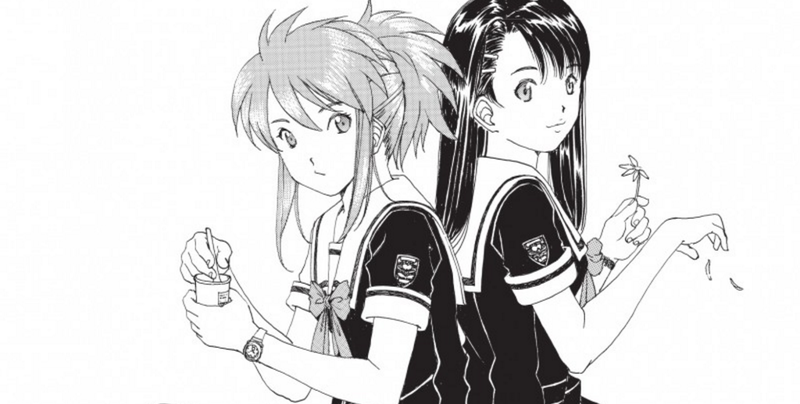 They were published before the series became an ongoing, acting as a zero volume story for the series. It filled in how the characters meet and established their personalities. Reading this content, I felt at times these smaller stories were better than some of the longer ones due to tighter pacing and actually establishing things instead of dropping us into the middle of a story already in progress. Paradise Residence Vol. 1 was overall decent, but not really my cup of tea when it comes to slice-of-life comedies. It was pretty slow going and uneventful a lot of time, while the humor was quieter and less energetic than I expected. Plus, some of the writing and artwork was off at points. However, there are enough positive things about the series that I can at least recommend it to someone looking for a more laid back manga.